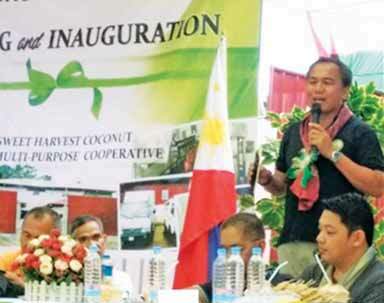 The sweet harvest Coconut Multiple Cooperative’s (SHCMC) P25 million project, “Kaanib Enterprises Development Project” (KEDP), was recently launched. The operation of the hub shall provide benefits to hundreds of small coconut farmers in the municipalities adjacent to Carmen, Cotabato like Aleosan, Magpet, Alamada, Arakan, Kabacan, and Pikit, particularly in providing employment to coco sap tappers and women processors. According to Jerry John Taray, chairperson of the SHCMC co-op, the hub will encourage and capacitate small farmers to produce partially processed coco sugar or syrup. In turn, the hub will buy the syrup from the farmers at good prices. Gathering of the coco sap. Syrup is made by boiling freshly harvested sap immediately after each harvest for a few minutes. 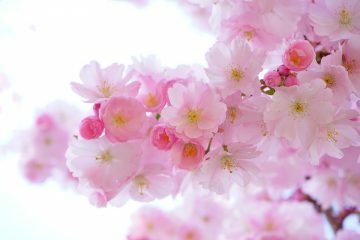 The purpose is to arrest the conversion of the sap into wine or vinegar. The final stages of processing, packaging, and storage for export is carried out in the hub. Participating farmers and coconut sap harvesters will be provided with extensive training on organic coconut farming, scientific sap gathering, and partial processing. The SHCMC will help facilitate the certification of the farmer participants’ farms as organic farms. Each farmer-cooperator will be provided with a standard stove of two to four vat capacities or “cawa” to partially cook freshly harvested sap into syrup. Farmers who regularly deliver syrup from their organically grown coconut trees in good quantities will be invited to become members of the coop with a share of its income through dividends. Consequently, they become entrepreneurs who will be trained to produce other high value coco products. The production of coco sugar provides high incomes for both farm owners and sap gatherers. 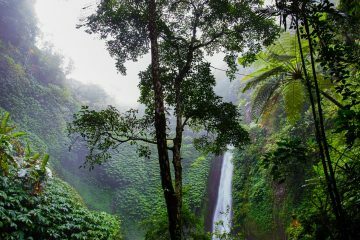 This writer’s research shows that a healthy, organically grown coconut tree produces an average sap yield of 2.0 liters (L)/tree per day. The yield can be more during the months of high rainfall and when high yielding varieties or hybrids are used. The hub will buy the sap at P8/L, of which P4.50 goes to the tapper while R3.50 will go to the landowner. A hectare of coconut of 100 to 120 trees below 25 feet tall requires two full-time sap gatherers tapping 40 to 70 coconut trees. Depending on the skills and speed of the tappers, the height of the tree, and the terrain of the land, a hectare (ha) of coconut farm with two coco sap gatherers is expected to generate a combined income of P576,000 (Table 1). The amount of P324,000 goes to the two sap gatherers and P252,000 goes to the farm owner. This means that each sap gatherer generates an income of P162,000/year or P13,500/month. As shown in Table 1, the higher income from coco sugar production can be further increased by planting high yielding hybrids and varieties at higher densities of 200 plants/ha. Table 1. Projected income of farmers and coco sap gatherers in coco sugar production. Based on the results of the experiments carried out by this writer, following the technology of high density planting in Thailand and Malaysia, dwarf coconut varieties like the hybrid “Matag” and the superior varieties “Nam Wan” and “Nam Hom” are most productive at a closer population density of 200 trees or at a distance of 7 x 7 meters (m). 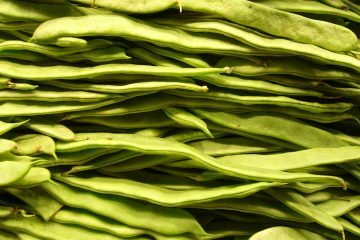 Matag is planted in Malaysia at 200 plants/ha; Nam Wan and Nam Hom are planted in Thailand at a population density of 270 plants/ha. At a density of 200 plants/ha, the coconut varieties planted as part of the experiment in Kabacan, Cotabato showed that these hybrid varieties have the same or much higher sap yields over the traditional varieties planted at the low density of 100 trees/ha. The high sap yield of Matag was confirmed in the experiment carried out by PCA (Philippine Coconut Authority) researchers at the Zamboanga Experimental Center, conducted by Dr. Ramon Rivera and his team. 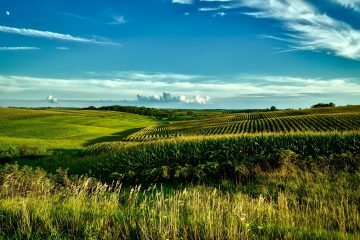 They found that during rainy months, the yield averages 2.9 L/day. This means that coco sap yield can be increased by irrigation. Indeed, in Cotabato, the onfarm survey of this writer showed the sap yield of coconut trees planted adjacent to irrigation canals and rice fields averaged more than 3.0 L/day. At high densities, planting a hectare of coconut for coco sugar production can give an income of over P1 million/year (Table 1). an on-farm facility (still under construction) meant to provide co-op farmers with a place to cook the sap into syrup. A survey carried out by this writer in the province of Cotabato showed that the yield of coconut trees with heights of 25 feet or less averaged 60 nuts/tree/year or 6,000 nuts/ha/year. He found that typical coconut farmers who process and sell their products in the form of copra earns P46,000/ha/year. If the end product is dehusked nuts, the farmer earns higher (P58,000/ha/year). This means that even with two ha, farm owners remain poor as their incomes from the sale of either copra or dehusked nuts is below the national poverty threshold level of P135,000/year. The labor income for copra worth P23,000 is higher than the income when the end product is dehusked nuts at P11,800. 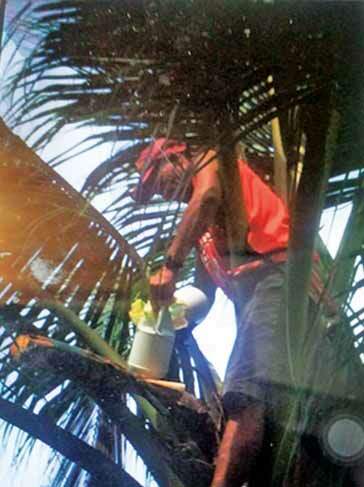 A coconut farmer with one ha producing and selling coco sap for sugar earns P324,000/ha/year. This is above the poverty threshold level. S/he also provides a high income of P162,000 to each of the two sap gatherers s/he employs, which is also above the poverty threshold level. This shows inclusive growth among the farm owners and the tappers as their incomes are above the poverty threshold level. Spouses Jerry John and Jocelyn Taray are the enterprising couple behind the establishment of the cooperative which operates the hub. Years ago, after returning as OFWs, the Tarays were looking for crops to plant for high income. The coconut tree was not among the crops they wanted to plant. It was PCA coconut breeder and Jerry’s buddy Gerardo Baylon who convinced the Tarays to plant coconut. Jerry Taray bought coconut seedlings and planted a few hectares to the high yielding varieties Tacunan and Catigan. As the Tarays attended an international conference on coconut, they met a foreign participant who convinced them to produce organic coco sugar, which he guaranteed to buy at a good price. Jerry Taray took on the challenge by working hard to meet the quality requirements, hiring hired sap gatherers for his fruiting organically grown coconut trees. He sought the help of experts like Tommy Jalos, who was then the PCA regional manager for Region 12. Jerry John Taray welcoming the guests and visitors during the inauguration of the hub. He also tapped the support of the Department of Agriculture (DA), Department of Trade and Industry (DTI), Department of Science and Technology (DOST), and other agencies for the facilities and technology to produce world-class organic coco sugar. The hard work paid off; the Tarays’ production of high quality coco sugar generated interest among many foreign buyers. Jerry Taray traveled abroad extensively and exhibited his product at trade fairs in Australia, Japan, Germany, France, and the USA. He got commitments from prospective buyers who wanted to contract with him to buy coco sugar. These buyers told him that his product was better than those produced by other countries. Soon, the small family enterprise called “Tree of Life” that Jerry and Joy Taray put up to produce coco sugar could no longer cope with the increasing demand. That was why they organized the SHCMC and sought the help of the PCA in putting up the hub for large-scale production. The strategy is to partner with small landholders with organically grown coconut trees to produce the coco syrup which the hub would buy for final processing. Aside from the PCA and the other government agencies mentioned earlier, they got commitments of support from Landbank, the province of Cotabato, and others. Jerry Taray plants to expand, with his farmer-partners, the production of other high value coconut products at the Hub for which there is a high demand in the world market. His mindset towards coconut trees has completely changed. Coconut is no longer a “poor” crop for him; now, through partnerships in the Hub, it can be used to help others. It is his wish that coconut sap tappers make wise use of their new higher incomes in sap production. Many of them mismanage this, and he would like to help them become highly paid quality employees: trustworthy, disciplined, and industrious. 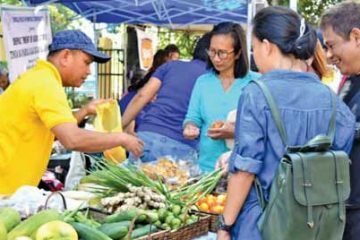 He believes they should be responsible stewards of their incomes and to this end, he plans to tap the assistance of TESDA and community spiritual leaders. The PCA initiated and financed this hub, only the second of its kind in the country. It is this writer’s belief that the PCA should establish many more similar hubs, and not be limited to coco sugar but also aim for the production of other high value coconut products which are in high demand in the world markets. The hub should be selected wisely so as to provide small coconut farmers with high incomes for inclusive growth in order to help them overcome poverty. Such products include the coco water from mature nuts, minimally processed young nuts with coconut water and soft nuts, coconut milk, virgin coconut oil, desiccated coco flour, and coconut pastries. 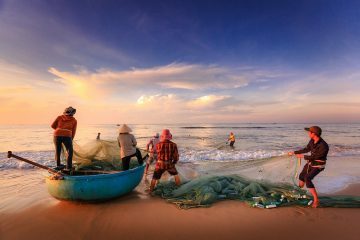 Many successful coco hubs in India, Thailand, and Sri Lanka can serve as models to follow. properties that help prevent or cure many diseases. There is also an increasing demand for coco milk in China, as with virgin coconut oil, coconut chips and pastries as healthful snacks, and for more coco products worldwide. Coconut farmers from other countries like India, Thailand, Sri Lanka, and Brazil are partially meeting the increasing demands but still more products are needed to close the gap. Farmers in India with less than one ha earn incomes of over a million pesos by selling coconut high value export products through their hubs. Here are two recommendations for the PCA. Conduct more research and market promotions: The PCA should intensify its research to generate new and improve existing technologies and innovations in coconut. New coconut products should be made readily accessible to the world market. Research is needed to improve the quality of coco sugar and at lower costs of production for competitive purposes. Information available to the author as of this writing reveals that the Indonesia’s farmers are already producing the same quality of coco sugar produced in the Philippines at a much lower cost. Consequently, they are offering their coco sugar in the world market at a reduced price: only 70% of prices set by Filipino coco sugar processors. A model to follow in research and development in coconut is what the Malaysian Palm Oil Board (MPOB) did with oil palm. After five decades, a lowly crop from Africa became a major source of cheap vegetable oil plus hundreds of other diversified products readily available in the world market. The Philippines imports annually almost US$ one billion worth of palm oil from Malaysia, which provides Filipino homemakers with a vegetable oil which is much cheaper than coconut oil. Multidisciplinary and consumer-oriented research at MPOB was responsible for this. Research is being carried out by over 100 full time researchers—almost all of which have Ph.Ds from the best universities in Europe and USA. According to Oil World (2016), the world trading of vegetable oil is topped by palm oil at 31%, 25% for soybean, 12% for rapeseed, 8% for sunflower, and only 1.0% for coconut oil. The current Philippine export of coconut oil and other related products at US$ 1.7 billion annually can be multiplied several times with effective research, product development and market promotion. Table 2. Comparative annual income of a coconut farm with 100 trees/ha in the province of Cotabato, as affected by the sale of various end products. Overcome poverty through inclusive growth: The PCA should provide support for programs and strategies like the coco hub, which has the great potential to give its participants higher incomes and create inclusive growth so as to help overcome widespread poverty in coco lands. This end product is important as the traditional sale of copra and dehusked nuts doesn’t bring about inclusive growth; only the processors of copra and dehusked nuts become wealthy. The coconut farmers remain poor. Of course the PCA should encourage buyers of dehusked coconuts and copra to bring about inclusive growth in the coconut industry as is done in other countries. As observed by this writer, dehusked nut buyers in the Philippines and those in other countries process the same export products, like coconut oil, coconut water, desiccated coconut, and coconut milk for the export market. The difference is, processors in the Philippines pay local farmers lower prices compared to the prices paid by processors in other countries like Thailand. For example, in May 2017, the price of dehusked nuts in the Philippines was only P8/kg while those in Thailand were P14/kg. This writer asked one of the dehusked nut procurement executives in the Philippines buying one million nuts/day the reason why. He told this writer that he equates the price of dehusked nuts with the level of the price of copra. This writer asked the same question of a dehusked nuts buyer/officer in Thailand, and he was told that their pricing in Thailand is based on the market price of the processed products like coconut water, young nuts, processed milk, etc. According to this Thai nut procurement officer, part of the high income from the processed products is being shared with the farmers as a part of their corporate social responsibility. There are many ways of overcoming poverty in coco lands and the PCA should adapt as many of these as possible. Other than those discussed above, these techniques include intercropping with high value crops like cacao; integration of livestock like native chicken, goats, and cattle; and massive replanting of hybrids and high yielding varieties to increase farm productivity and income. The Philippine Coconut Authority (PCA) provided P13.9 million for the purchase of state-of-the-art equipment for use in the production of world-class quality coco sugar for export by the SHCMC’s KEDP. Other costs were funded by a loan from Landbank and by the Tree Life Enterprise (TLE), in Carmen, Cotabato. In addition, TLE donated a plot of prime land at the center of the poblacion of the municipality of Carmen where the hub’s buildings are constructed for equity. TLE, a family enterprise owned by the Tarays, successfully pioneered the production of export quality organic coco sugar in Cotabato. The coco sugar produced by TLE has gained wide market acceptance, thereby creating a huge demands for it which will be met by the SHCMC. TLE will share the technology of the production of world-class coco sugar. Guests, visitors, and members of the SHCMC were excited and optimistic during its recent inauguration. 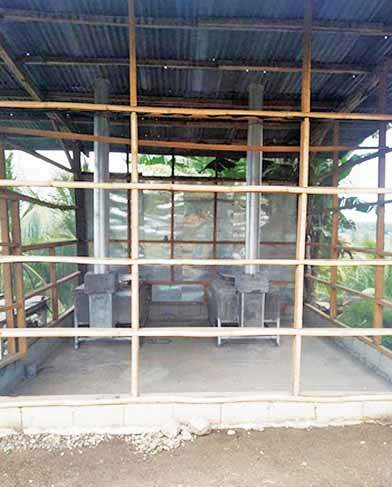 The hub is expected to bring high incomes to participating coconut farmers, four or more times higher than when a farmer sells copra or dehusked nuts. A farmer who does well in serving the cooperative qualifies a farmer to become a member of the coop as an entrepreneur earning dividends. Many high income jobs in the tapping and processing of coco sap to coco sugar will be created. The project is destined to provide inclusive growth to the coconut industry, thereby helping overcome poverty in coconut lands. Many national key officials of the PCA came for the inauguration, headed by Administrator Romulo Y. dela Rosa. Representatives of the DTI, Landbank, DOST, and the provincial government office of North Cotabato were also present.